The Somerset Patriots got the lift they needed in the form of a 4-0 complete game shutout by Will Oliver (1-0) over the Long Island Ducks to even up the Liberty Division Series on Saturday night. The win forces a deciding Game Five at TD Bank Ballpark on Sunday evening. Oliver scattered just three hits and struck out two over his nine innings of work in a do-or-die elimination game for Somerset. “You can tell basically by pitch one that he was going to pound the zone all night, mix it up, keep them off balance and he wanted to go the distance. 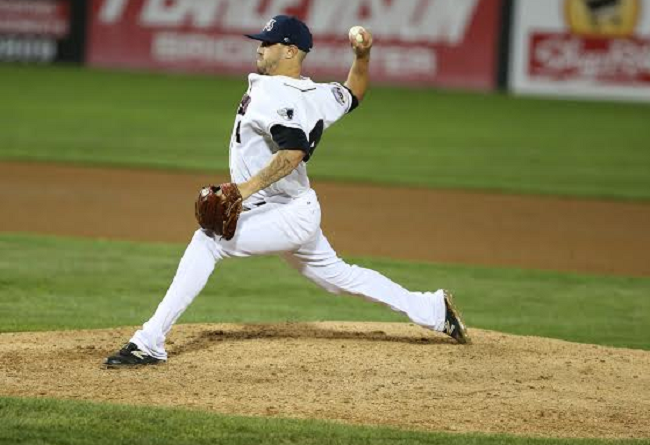 It was a great outing in a time of need and he really showed me a lot,” said Somerset Patriots manager Brett Jodie. The game was scoreless until the sixth inning when the Patriots broke through for three runs. Matt Fields drove an RBI single to plate Thomas Neal for the first run. David Vidal followed with a two-run double on a 3-0 pitch to make the score 3-0. “I’m just trying to look for a good pitch. You know we hardly swing at 3-0 and Jodie told me if I like it swing. I was basically looking for a pitch away and it happened that he threw a fastball away and in my mind I was thinking just put a solid swing on the ball,” said Vidal. Somerset’s final run came in the seventh on an RBI base hit by Robert Andino that scored Ollie Linton, who was hit by a pitch earlier in the inning. Bruce Kern (0-1) suffered the loss for the Ducks, giving up three runs on five hits in six innings pitched. The 2015 Liberty Division Championship Series will continue with Game 5 at TD Bank Ballpark on Sunday night at 5:05 pm. For more information, or to purchase tickets, visit www.somersetpatriots.com.